A cleanroom has a particular level of contamination that is specified by the number of particles/m3 and by maximum particle size. 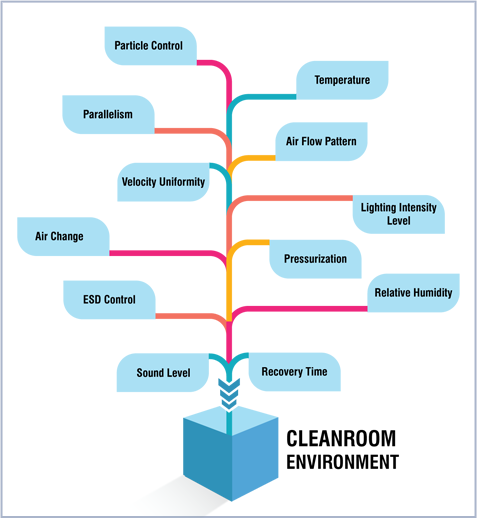 To provide an interpretation, external environment would be considered about a 5,000,000 class cleanroom. Cleanrooms can be small or very large in size. A whole manufacturing industry can be placed within a cleanroom with factory floors ranging thousands of square meters. They are used at a great extent in Semiconductor manufacturing, Life sciences, Biotechnology and other scientific fields that are very sensitive to environmental impurity. The air getting into a cleanroom from outside is filtered continuously to remove dust and the air inside is constantly recirculated through High Efficiency Particulate Air (HEPA) and Ultra Low Penetration Air (ULPA) filters to remove internally produced impurity. Our fanatical commitment to building the best has made us a renowned Laboratory Furniture Manufacturers. The extraordinary fit and finish laboratory furniture reflects. Wall panels form a substantial part of our product offerings. MK Enterprise wall panels are manufactured in standard sizes and can also be customized depending on the requirement.